My good buddy and business colleague Matt was visiting from London. 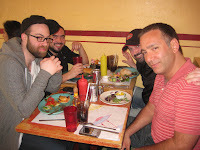 Although a devout vegetarian, Matt has participated in past Burger Conquests. He’s a good sport about the whole thing which is a reflection of his generally positive attitude to just about everything. During Matt’s visit to NYC he worked out of our office when not at meetings or shows. 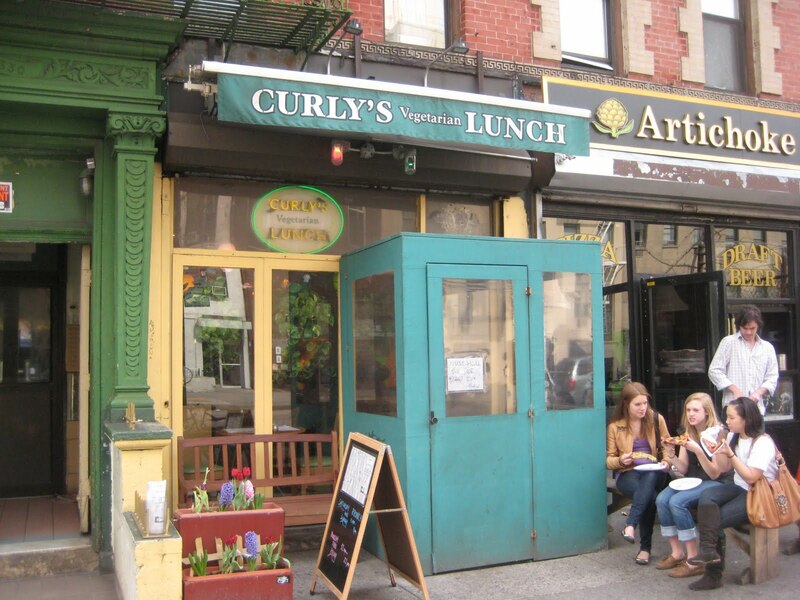 So when the chance to grab lunch with him came up, I suggested we hit my favorite vegetarian restaurant in NYC – Curly’s Vegetarian Lunch. 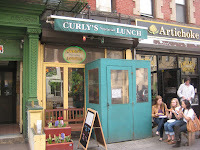 Curly’s is located just a few blocks east of Union Square technically on the borders of Stuyvesant Town, the East Village and the Gramercy-Flatiron District. They are only open from 11 am to 11 pm on weekdays with a focus on their classic diner-esque fare. There is a lot to choose from on their menu but all of it … and I mean every single item, is vegetarian. While I am clearly not a vegetarian, I do have an appreciation for the cuisine and believe in equal opportunity eating. Besides, you really shouldn’t eat meat for EVERY meal! Since I have been on somewhat of a health kick, post SXSW, this gave me a perfect excuse to have a veggie burger conquest. 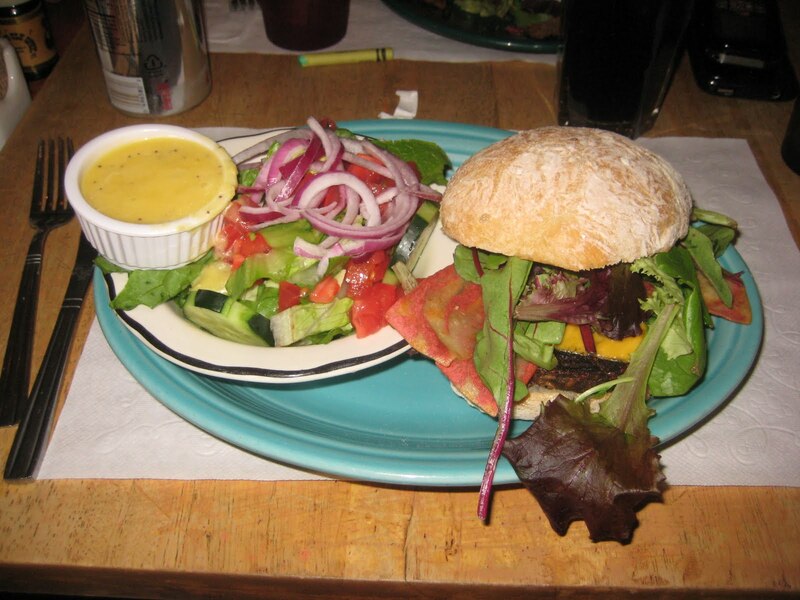 While Curly’s really does have a wide offering from veggie burgers to breakfast to burritos, salads, smoothies and all sorts of mock-meat sandwiches, the choices are really diverse. 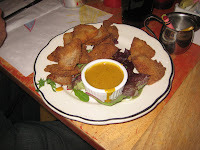 We started with an order of the mocknuggets, a pun of the McDonald’s “McNuggets.” Dipped in honey mustard and smoky BBQ sauce, they were pretty good. I mean at the end of the day, you can fry and bread anything and it instantly makes it tasty. The Curly vegetarian burger is a “A Homemade Vegan Patty Of TVP (texturized vegetable protein) Black Beans, Seeds, Vegetable, Onion & Garlic, On A Ciabatta Roll.” TVP has just as much protein as beef, zero fat content and cooks quickly. It really is one of the best options as a meat substitute. I ordered my topped with tofu bacon and cheddar cheese for an extra flavor zing. The ciabatta was fresh, crunchy and the type of quality bun that I wish regular burger spots would consider using! Tofu bacon has a smoky and salty taste to it that does it’s best to mock the bacon flavor and while it will never come close, it isn’t bad at all. The fresh spring mix of greens added a hint of a pepper back ground to mix well with the savory cheddar and tofu bacon. 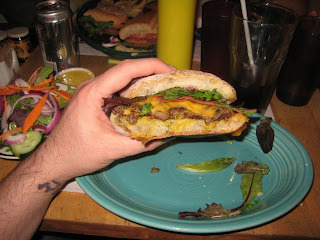 The patty itself although a little thin was chewy with a nice soft texture and a nice mix of flavors. Most prevalent was the garlic followed by the black beans. While neither overtook the taste of the whole sandwich, it was a good mix of flavors and certainly healthier than the meat equivalent(s). This entry was posted in Uncategorized and tagged the great burger conquest hamburger cheese french fries review veggie vegetarian curlys lunch new york ny nyc. Bookmark the permalink. Yummm, more posts like this please 😉 reading the online menu makes me wish I was in NYC right now… Hmm!